We design and build stand-alone units to deliver clean water where traditional sources are unavailable or compromised, too expensive, or environmentally unfriendly. These fully integrated, static or mobile platforms bring water pumping, purification and distribution solutions to diverse applications, including agriculture, development and security. Our water systems can deliver clean drinking water in remote areas that have little or no access to traditional infrastructure and they provide this immediately to those who need it most at a very low cost per litre. This stand-alone infrastructure is deployable by road or air and immediately reduces the logistical burden of a constant stream of bottled water. Basis-Africa’s WaterCube in action in Northern Kenya. Water purification systems powered by electricity are tied to the nearest grid by a transmission line and so have limited geographical reach. Systems powered by fossil fuel are tethered to the oil depot by a convoy of fuel tanks, with risks to life and security. Through the use of solar arrays and embedded battery banks we can also generate enough power for continuous operation of water production equipment without a diesel or grid constraint. Where water sources have been compromised, or are too environmentally unfriendly, we are able to assist in removing specific chemical contaminants. We are able to design, build, install and operate sophisticated biotreatment, filtration, adsorption and ion-exchange systems to remove CN, As, Cr, Mn, Fe, H2S, VOCs and many other industrially generated or naturally occurring compounds. feature_waterWe develop water treatment solutions side-by-side with our customers, utilising their knowledge of the situation and our access to treatment systems to provide customised responses to challenging water quality situations. Our technology partners are market-leading providers of more than 60 treatment approaches for organic and inorganic compound removal and we are pleased to be working with them as water stress continues to rise and the pressure on all parties to optimise the use of water resources increases around our region. In some circumstances the source of water is not near to the consumer. In these situations bottling of the water prior to transportation may be the only acceptable solution to getting the water to the consumer (commercial or otherwise) in a potable state. 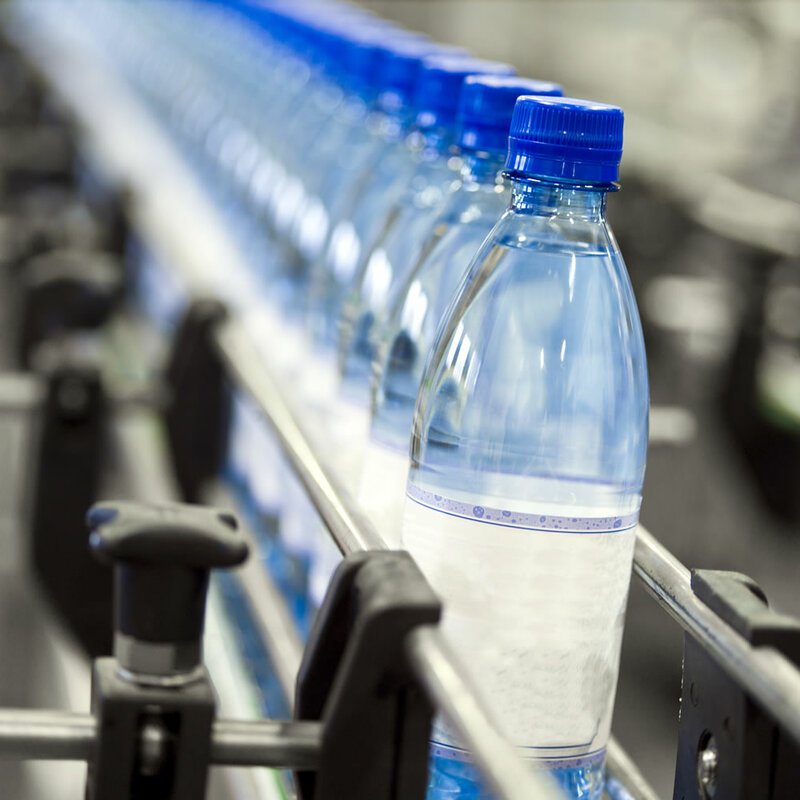 We can supply a versatile ‘bottling plant in a container’ system that can produce bottled potable water (or other liquids) at a rate of up to 100,000 litres per day in 0.2 litre to 5 litre bottles. The larger bottles can be fitted with handles and can be labelled. Alternatively, pouches can be produced for refilling camelback bladder systems. The systems come in 20′ or 40′ containers and are fully capable of producing bottled water by adding power, PET blanks, caps and clean water. The bottles are inflated from the blanks before filling with water, capping and sealing. The empty PET bottles are recyclable. The bottling plant designed to meet HACCP, IBWA and FDA regulations and uses an over-pressurised, insulated, dust-free environment, with UV treatment of water bottles and caps. The operation is fully automated to eliminate contamination risks and there is quality control in place from source to bottle. We provide rapidly deployable barrier systems for both flooding and blast protection. Our gabion-based systems are designed for critical asset protection. We can provide a reliable, easy to deploy and robust solution for the protection of critical infrastructure installations like power stations, transmission sub-stations, distribution control points; and for off-grid sites the protection of generators and control systems that may be at risk from hostile direct and indirect attacks. Our partners manufacture a flood barrier that has been designed specifically for emergency flood defence. The system is a highly cost-effective, transportable flood protection barrier that can be rapidly deployed prior to, or even during, heavy rain and severe weather, when there is a recognised danger of flooding. After the rain, sea or river water has receded the flood barrier can be easily dismantled and stored ready for the next flood event. This makes it ideal for flood risk exposed power stations, transmission control points and sub-stations – structures that are often on multiple small sites that require regular access and point-specific protection. Security fencing offers a relatively low-cost method of securing assets. We have worked with a number of suppliers regionally and are confident that we can find the optimum solution for security fencing should this be the best solution for protection of your power generation assets.